Who is the guitarist in the Wonga advert? Find out below. Who is the guitarist in the Wonga advert? What prompted that question you may ask? Well the other day I was watching a film that I had recorded. Unfortunately, as is often the case, my enjoyment of the film was spoilt by a break every few minutes, or so it seemed, for the adverts. Because I had taped the film I could fast forward through these adverts. However, whilst doing this I spotted an advert featuring a guitar. Now because I am a bit of a guitar nerd I had to rewind and watch the ad and I am truly glad I did because I was given a few seconds of some truly amazing guitar playing. If you haven’t seen the advert then you can check it out below. Don’t be put off by the fact that it is Wonga it is a great bit of guitar playing. So having watched the advert and being blown away by the guitar playing I had to answer the question running through my mind. Who is the guitarist in the Wonga advert. A quick search of the internet showed that there was some debate about the identity of the guitarists in the advert. In fact many believed that it was all just a CGI mock-up. 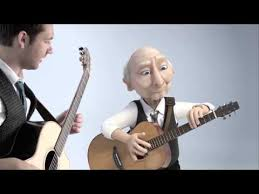 In fact Wonga have confirmed that there are two guitarists in the advert Ben Lapps and Mike Dawes both well known finger style guitarists. Mike Dawes, a Bath Spa University music graduate, was commissioned to write and perform the piece. However it is Dawes who has been computer enhanced to look like Earl the pensioner featured in all the Wonga ads. What I am hoping is that the advert has helped to raise the profile of two exceptionally talented guitarists without prompting people to use the services of Wonga. If you want to find out more about Mike or Ben, and trust me it is well worth it, visit their websites by clicking on the links below. Check out the Matchstick ’54 Stratocaster – It is made from Matchsticks! Klaxons go on tour with 3D printed guitars.